You know what they say about Boracay being a destination for single party-loving young people who have lots of cash to throw around? Three years ago, I would have believed it so but my last visit made me see that the Philippines’ crown jewel is also a great family destination. My first visit to Boracay was in 2010, I was with two other female friends and we were there to experience the island’s epic nightlife. Our list of things to do in Boracay was quite limited then: sunbathe, eat, sleep, shop and party for four nights straight. Three years later, that list has made a dramatic turn for the better. Boracay is world-famous for its powder-fine white sand beach flanked by clear blue waters. No matter how hot the day becomes, the sands of Boracay remain cool to the feet so it’s never uncomfortable to remove your flip flops and run barefoot. Whether you build sandcastles, bury yourself in the sand, play beach volleyball or Frisbee or learn the tricks of skim-boarding, this activity never gets too boring. This isn’t for everyone but if you’d like some time off from playing in the water, a few minutes of strain on your arms and legs will do you some good. Children with can also do this under adult supervision. 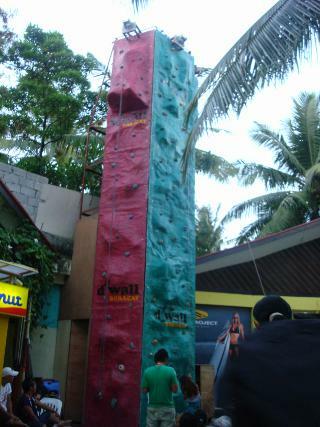 The wall is located in the middle of D’Mall Plaza, right by the Hobbit House so it’s really hard to miss. The wall is manned from 2PM to 10PM and there’s usually no big crowd around. I tried this during my two visits and both times I was able to make it to the top. The feeling is quite exhilarating especially when a lot of people start cheering you on as you near the finish. After my second successful climb, a couple from Norway actually congratulated me. I wondered if maybe they did so because I made it despite my weight (LOL). If the weather is great and you have at least three hours to spare, hire a boat to take you around the island and to nearby islands. It’s one thing to see the long stretch of beach while you’re in Station 1 and it’s an entirely different experience to see the sand strip from a distance. You’ll realize just how far you walk everyday just to get to D’Mall from your hotel. You can have your hotel arrange this for you or just head to Station 2’s beachfront where all the vendors and boatmen are waiting. The usual island hopping tour takes you around the island to see the different resorts including the ultra-exclusive Shangri-La and the recently demolished Boracay West Cove which, according to locals is owned by boxing champ Manny Pacquiao. 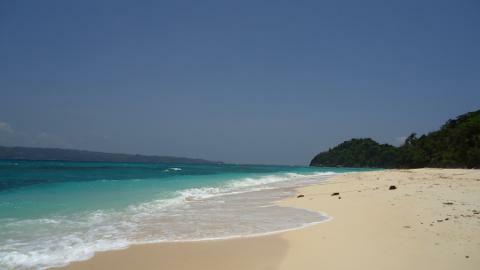 Other stops will be Crystal Cove, a snorkel spot close to Crocodile Island, Puka Beach and Bulabog Beach. 4. Snorkel or Helmet Dive. I personally recommend that you do these while island hopping to save time, money and boat rides. Snorkeling is usually part of the island hopping itinerary; the boat takes you to a spot close to Crocodile Island (it is named so because of its shape, not because it is home to the scary creatures, thank heavens). Once there, a smaller boat can rent out snorkels for P20 each; negotiate if they give you a price higher than P100. Boracay diving is a great experience but if you’re not really into swimming in open water, you can book a helmet diving tour instead. Also known as reef walking or aquanaut, this is the next best thing to diving. You’ll get your dose of underwater explorations sans the oxygen tanks, plus you get souvenir photos and a video to show off! There’s really not much to see up there but tops of buildings around Station 2 but if you have a kid in tow, it may be worth it. 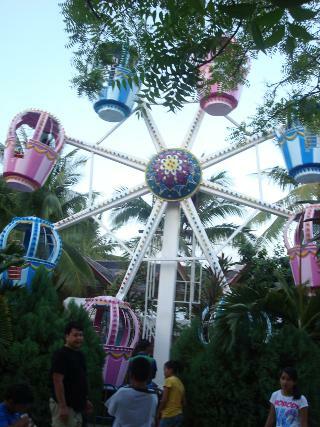 It is also located in the middle of D’Mall Plaza and opens at sundown (that is, I never saw it moving during daytime). A car can carry up to three adults but you might want to ask the attendant about the capacity just in case. The baby loved riding the Ferris Wheel and could not stop waving at the oblivious people below. We didn’t get the chance to try it but I have heard so many good things about this activity in Boracay. Zorb balls aren’t exactly new but the one in Boracay takes it up a notch by making you roll down a not-so-steep hill into a waiting pool. You’ll be sloshing inside the ball as you roll downhill which can be fun. This is not for small children but those over seven can go for it. There are harnessed and un-harnessed rides and it’s all up to you if you want to roll with the orb or simply tumble around as it moves. 7. 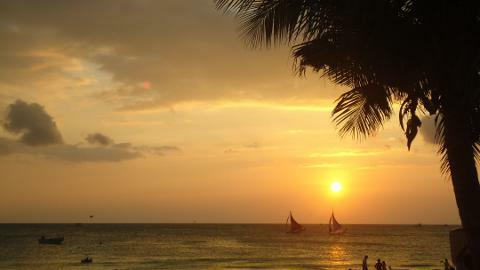 Chase the Famous Boracay Sunset. Of all things to do in Boracay, I think this one makes it to everyone’s list. During summertime, the sunset on White Beach is so spectacular that it might just be one of the most photographed sunsets in the Philippines. It is as if everything in the island is at a standstill as the sun comes down; even the busy paraw boats come to shore at this hour. Expect a lot of people to crowd along the shore during sundown; if you want to take great photos, secure a position as early as possible. Or if you want a more romantic setting, hire a paraw and go on sunset cruise. If you’re up for a land tour, you can arrange a trip to Boracay’s highest point, Mt. Luho. Needless to say, the view from up there is astonishing, especially on a bright, clear day. You can take a tricycle up to the entrance to the viewpoint or you can rent a buggy or ATV and drive; the trike is cheaper, of course. Aside from the stunning 360-degree views of the island, Mt. Luho also boasts of a collection of animals on display like civets, monitor lizards and snakes. White Beach can be really crowded especially if you’re visiting during peak season. SoiIf you’d like some quiet time on the beach, hire a tricycle to take you to Puka Beach, another famous but not yet commercialized part of the island. The sand quality here is a far cry from that of White Beach mainly because they’re made of coarsely crushed puka shells, thus the name. The place is quite isolated and you’ll seldom see a vendor offering his/her wares. There are some huts selling souvenir items but they can be quite expensive compared to those sold in the main part of the island. During my last visit, restaurants have now found their way to Puka Beach and I still could not decide if it’s something good or bad. I personally believe that vacations are never quite complete without shopping for souvenirs and goodies (pasalubong) for the folks back home. While the selections along the beachfront and in D’Mall are attractive and quite reasonably priced, you’ll get more value for your money in D’Talipapa. The place is mostly known for its wet market where you can buy the day’s freshest catch and have them cooked at a nearby restaurant but there are also a good number of stalls selling all kinds of stuff from the clichéd Boracay t-shirts and key chains to personalized mugs, bags and musical instruments. As mentioned above, there are hundreds of other things to do in Boracay. Your options are endless and your time in the island might be your only limit. There are some activities that are quite expensive and they don’t guarantee a good time every time. And of course, there are other activities in Boracay that don’t require breaking the bank. If you have other things to add, please feel free to list them in the comment box below. We’d love to get your input on what else to do in this wonderful (albeit touristy) island.